Earlier this month, eight of the Territory’s most promising high school Science students showcased their individual projects during the STEP-UP High School Summer Research Symposium, held at the Community and Natural Resources (CNR) division of the American Samoa Community College (ASCC). The students had spent the previous eight weeks working with mentors at ASCC-CNR and other local agencies on self-designed projects focused on health and environmental issues. During the symposium, each student gave a 10 minute presentation on his/her research before an audience of professionals, family and friends, and answered questions before receiving their certificates of completion and stipends for participating. The National Institute of Diabetes and Digestive and Kidney Diseases (NIDDK) of the U.S. National Institutes of Health (NIH) sponsors STEP-UP, which stands for Short-Term Research Experience for Underrepresented Persons. The program is coordinated in the Pacific region by the University of Hawaii and locally by the American Samoa Department of Education with assistance from ASCC-CNR. 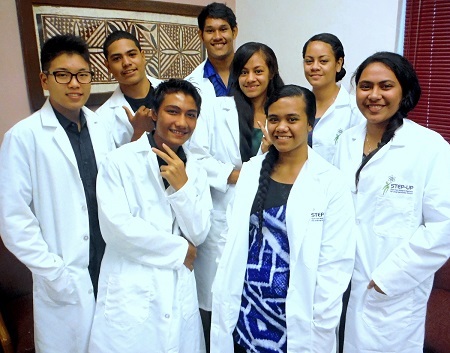 Given the Territory’s urgent need for health and science professionals who can help develop locally appropriate solutions to health and environmental challenges, STEP-UP aims to provide students with hands-on research opportunities, with the long-term goal of increasing the number of American Samoans embarking on careers in the biomedical sciences. Now in its seventh year in American Samoa, to date a total of 43 students have participated in the STEP-UP program. Each year, student applications from American Samoa’s public and private high schools are reviewed by a committee comprising representatives of the NIDDK and the University of Hawaii. Selected students are assigned to work with a local scientist mentor at ASCC-CNR or another agency. This summer’s eight participating students were Mr. Inny Mareko, Miss Nora Toalepai and Miss Taufagalupe Ve’e from Faga’itua High School; Miss Louisa Crawley, Miss Darlene Meli, Mr. Jacob Van der Ryn, and Mr. Johann Vollrath from Taufna High School; and Mr. Hyun-Duck Oh of South Pacific Academy. Miss Crawley, who worked with mentor Dr. Mark Schmaedick of ASCC-CNR, presented on her project titled Comparison of Thee Mosquito Traps for Lymphatic Filariasis Molecular Xenomonitoring in American Samoa Villages; Mr. Mareko’s project was Sodium Chloride Affects Growth of Taro, under the mentorship of Mr. Ian Gurr of ASCC-CNR; Miss Meli, under mentor Dr. Ndeme Atibalentja of ASCC-CNR, also focused on taro in her project Survey of Virus Diseases of Taro on Aunu’u; Mr. Oh, also mentored by Dr. Schmaedick, chose the topic Attractiveness of Three Gravid Trap Infusions for Ovipositing Polynesian Tiger Mosquitoes; Miss Toalepai, also mentored by Dr. Atibalentja, focused on Molecular Diagnosis of the Causal Agent of the Root and Crown Rot of Taro in Aunu’u; Mr. Van der Ryn, co-mentored by Mia Theresa Comeros and Ioane Tomanogi of the American Samoa Environmental Protection Agency, researched Reducing Solid Waste Quantities Headed for the Landfill in Futiga; Miss Ve’e, also mentored by Ms. Comeros, spoke on Marine Pollution Prevention in American Samoa; and Mr. Vollrath, mentored by Dr. Timothy Clark of the National Park of American Samoa, presented on the Distribution of Crown of Thorns Outbreaks along the North Shore of Tutuila. For the symposium, ASCC-CNR Dean and Director Tapa’au Dr. Daniel Mageo Aga welcomed guests from off-island Dr. George Hui, Professor at the University of Hawaii John A. Burns School of Medicine and Program Director of Pacific STEP-UP; Ms. Jennifer Curry, Program Specialist, Office of Minority Health Research Coordination, NIDDK, NIH; and Ms. Danielle Clements, also of the John A. Burns School of Medicine and Program Coordinator, Pacific STEP- UP. ASDOE Deputy Director Mr. Philo Jennings gave the Introduction for the program, and Ms. Magdalene Augafa-Leauanae of ASDOE, along with Dr. Schmaedick, served as co-moderators. Ms. Netini Sene, DOE Health and Science coordinator, also attended, along with mentors Dr. Clark, Ms. Comeros and Mr. Gurr. In his closing remarks, Dr. Hui expressed his pride in the progress made by STEP-UP in American Samoa over the past seven years. He also explained that 2016 will be the final year of the current funding cycle for the STEP-UP program. While efforts will be made to continue STEP- UP, this will be subject to federal approval. Local students interested in applying for an internship for summer 2016 can find more information at: http://stepup.niddk.nih.gov and http://stepup.jabsom.hawaii.edu. If you find any portion of the American Samoa Community College online information or functionality inaccessible, please contact us via email at accessibility@amsamoa.edu. In addition, please visit our accessibility page for information on the College's policies and procedures that include how to file a grievance with ASCC, as well as how to file a grievance with the U.S. Department of Education, Office for Civil Rights.